For the second straight year, Rangers Ballpark in Arlington, TX, is hosting World Series games. This year, the Texas Rangers welcome the St. Louis Cardinals to town and aspire to capture their first championship. The home team must hope that slightly warmer temperatures and the return of the designated hitter to the lineup will give them an advantage in tipping the Fall Classic to their favor. St. Louis will send veteran Kyle Lohse to the mound while Texas is still waiting to announce whether Derek Holland (ALCS Game 2 starter) or Matt Harrison (ALCS Game 4) will throw the first World Series pitch of the year in the friendly confines of home. Regardless of the combination of pitchers, things are likely to be inflated on the scoreboard since all of the pitchers surrendered at least three runs in less than six innings of work in their League Championship Series outings. The addition of the designated hitter into these lineups for the next three games will raise those odds, as well. Rangers manager Ron Washington was notably careful regarding his pitchers hitting and running the base paths in Busch Stadium to prevent injury, so you’ll likely see a more aggressive Texas unit. Cardinals manager Tony LaRussa, oft-regarded as a chess player with pinch hitting and player switches, could have a reduced advantage in strategy because it’s no longer imperative to move the pitcher’s spot in the lineup to maximize opportunity. LaRussa did capture two World Championships when he was the Oakland manager, so the DH format will not be new to him, but rosters are built and managed differently in the two leagues and he may simply lack the flexibility he’d prefer in an AL park. Fans in Arlington are hoping for better results than last year’s World Series games in Texas. Down two games to none when returning from San Francisco, the Rangers managed to win the first game but then dropped the next two in the face of the Giants’ shut-down starting pitching. This year’s Series is not being billed as a battle of pitching, so hometown fans may be treated to more than an average of two runs per game from the Rangers. The Cardinals are a remarkably similar team, as detailed in our 2011 World Series Game 2 preview, so dueling fireworks may be in store for a ballpark known around the league as a launching pad. The Texas Rangers have taken full advantage of their home field advantage lately, winning 11 of their last 12 games in Arlington dating back to the regular season. Will the St. Louis Cardinals continue their string of late-season road success is such a hostile environment? First, let’s just say you won’t miss seeing this infrared view on the television broadcast. Seriously, though, the cheapest tickets you’ll find at the moment are Standing Room Only (SRO) ones for $329. 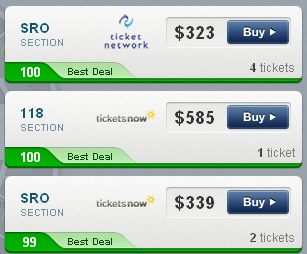 That happens to be the best Deal Score on SeatGeek, as well. The best Deal Score you can find for an actual seat behind the Visitor Dugout even with third base (section 118) for $585. The cheapest seat prices – with fair Deal scores, at that – are available in the Left Field Upper Deck (section 301, $467), down the First Base line in the Right Field corner (sections 338 and 343, both $489). 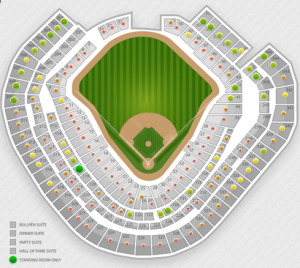 If you want to park yourself behind home plate to get as close to a batter’s eye view as possible, section 25 has tickets starting at $809… but it also has the most expensive seats left in the house that aren’t in a private suite – $6,730 / ticket. And, finally, for that person out there looking for 18 tickets to see the game with his closest friends in a private suite: write that check for $45,615. But don’t leave the plastic at home because food and drink aren’t included. And it’s not BYO craft beer cans, either. They’ll confiscate that at the gate, you know. Try to jump on those seats as soon as possible if you don’t want to stand around all night. Their supply is much more limited than SRO tickets, so prices are sure to rise much faster as demand heats up. 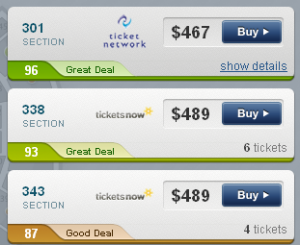 Questions about 2011 World Series Game 3 Ticket Prices and Deals? Find us on twitter @SeatGeek or write chad@seatgeek.com.